Heat a gas grill to medium-high or light a charcoal fire and let it burn until the coals are very hot and covered with gray ash. Grill the tomatoes, chiles, and garlic on the hottest part of the grill (to avoid loss, put them on a perforated grill pan or a grill mat). Use tongs to turn them every once in a while until blackened and soft, about 10 minutes total or longer. Remove and cool. Slip the papery skins off the garlic, scoop into a mortar along with the chiles and crush to a smooth paste. Add the tomatoes to the mixture one at a time (remove the skins if you want a less-charred salsa), crushing them into a coarse purée. (The salsa can also be made with a food processor by using it to finely chop the garlic and chiles, then adding the tomatoes and pulsing everything into a coarse purée.). Scrape the tomato mixture into a small serving bowl. Scoop the chopped onion into a strainer and rinse under cold water. Shake to remove the excess moisture and stir into the tomato mixture along with the cilantro. Taste and season with salt, usually a generous 1/2 teaspoon. Brush or spray both sides of each fish fillet with oil and sprinkle with salt. Lay the fish on the hottest part of the grill. Cook (without attempting to move or lift from the grill grates) until well browned underneath, usually 3 to 4 minutes. Use a spatula to flip the fillets over onto the coolest part of grill grill. Let the fish coast to doneness—it will give slightly under firm pressure, check it after about 2 more minutes. 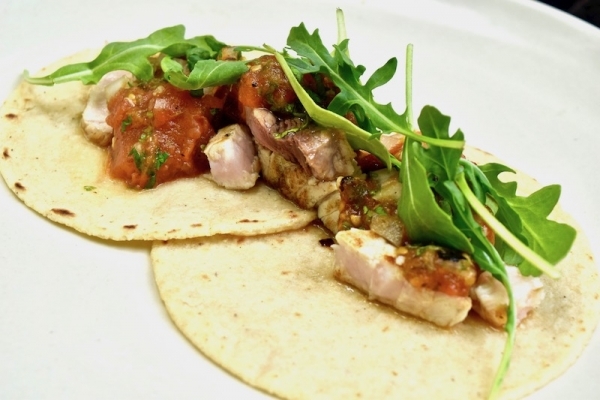 Slice the swordfish into ½-inch strips, scoop into the warm tortillas, top with the salsa and some baby arugula if you wish. Serve immediately.